Breathing Buildings installation team can provide full mechanical installation services on sites across the UK. Our experienced team have all necessary site clearance and have successfully installed hundreds of units on the whole range of Breathing Buildings product types. 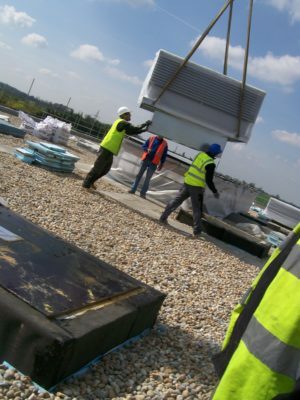 In the majority of projects the installation of Breathing Buildings equipment is performed by the mechanical contractor, as part of the wider M&E installation. In these cases, Breathing Buildings provide full-detail install drawings, supported by our team of project delivery engineers who attend site post-install to inspect and commission the system. We can also offer installation training at our Soham facility at no additional cost. The latest operating software will be uploaded and any final adjustments as might be necessary will be made before sign-off is given to hand the system over to the client. Once the building is finally handed over to the end client, Breathing Buildings are very happy to re-visit the completed site to provide a client demo session. Ensuring that the end user fully understands how their new breathing building will work to ensure thermal comfort and air quality through all ranges of external conditions.